gouache, graphite & watercolour on Arches 300 gsm paper. I have been looking at pictures of sea creatures ... Totally captivating. 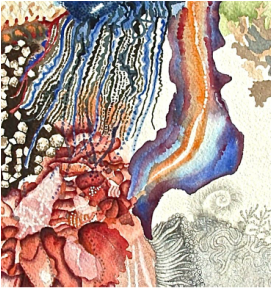 I wanted to combine marine-based forms in a phantasy, to render the enigma of their shimmering, bubbling, writhing, glimmering strangeness. I looked at cnidarians, acanthaster planci <crown of thorns starfish>, Eucrossorhinus dasypogon <tasselled wobbygong>, microscopic structures and platyhelminthes <flat worm, but it’s so much more than it sounds!>, just to name a few.